SANTA BARBARA, California – The Santa Barbara Wine Collective, the newest trail-blazer in the celebrated Urban Wine Trail centered in Santa Barbara’s downtown Funk Zone announces new partnerships with six wineries from Santa Barbara Country. 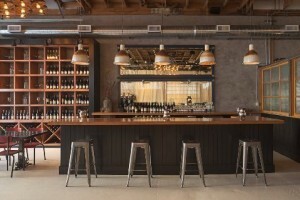 The Collective is the first communal tasting room in the Funk Zone where locals and visitors can taste and explore wines produced by this group of exceptional winemakers. The award-winning winery members have already gained international notoriety for their achievements in the wine industry – Bryan Babcock of Babcock Winery, Matt Dees of The Paring, Blair Fox of Fess Parker Wines, Eric Railsback of Ca’ Del Grevino, Raj Parr and Sashi Moorman of Sandhi and Bob Linquist of Qupe. The Santa Barbara Wine Collective, located in Suite C of 131 Anacapa Street in Santa Barbara, adjacent to sister business Les Marchands Wine Bar & Merchant, showcases the incomparable and vast terroirs that produce a range of varietals not found in any other region in the world. Santa Barbara County’s diverse soils, climate changes and temperatures allow for a stunning spectrum of wines within a ten mile area that include Pinot Noir, Syrah, Chardonnay, Riesling and Viognier. With this group of like-minded producers, each winery produces wines of elegance and balance while representing a true sense of place and features premium wines, many of which are rarely found outside of the estate properties. The Collective is the only tasting room in Santa Barbara County where the public can taste wines from several producers side by side to experience how varying styles, climates and soil compositions directly impact the characteristics of each wine. All wines are available in tasting flights, by the glass, and by the bottle. Leading the daily operation of the Collective are General Manager Alejandro Medina and Certified Sommelier Megan Cline. Medina and Cline are fast developing an inventive program of regular tastings and seasonal events paired with local epicureans, including winemaker dinners, new release and wine club pick up parties and pop-up brunch, lunch and dinner events. The winery members will have rotating schedules with special tastings where then may meet the winemakers and learn more about their varietals firsthand. The Collective will also serve as a learning center for Santa Barbara County Wines with a schedule of seminars and classes open to the public. With spacious interior, high ceilings, outdoor patio and a capacity for over 100 guests, the Collective presents an ideal location for special events, private business and social gatherings and is available for semi-private and buy-out parties. The Collective is the latest design by restaurateur and designer Doug Washington, who is responsible for the inimitable style of neighboring businesses The Lark, Lucky Penny and Les Marchands Wine Bar & Merchant. Washington brings his singular urban style integrating vintage and repurposed materials for a sophisticated yet casual sensibility. Located adjacent to Les Marchands Wine Bar & Merchant in the 10,000 square foot historic warehouse originally built by the Castagnola family in the 1920’s, The Santa Barbara Wine Collective is open Tuesday through Thursday from 12:00 p.m. to 6:00 p.m., Friday/Saturday from 12:00 p.m. – 7:00 p.m. and Sunday from 12:00 p.m. – 6:00 p.m. The flights from Babcock, Ca Del Grevino, Fess Parker, The Paring and Sandhi are offered at $15 for a complete Santa Barbara County experience. Qupe wines will be available after May 1. Retails sales and wine club memberships of all selections will be sold on site. Wine club shipments are planned quarterly in addition to an exclusive combination collection for members.